Long has San Clemente, the magical “Spanish Village by the Sea” been a bit of a remedy to Southern California’s “big-city beach town” mentality; its village lifestyle and approach to the day-to-day inspire a genuine appreciation for relaxed mindsets. Promoting that lifestyle is the new charge of recent Lake Tahoe transplant Marjorie Woodbridge. Marjorie is the new General Manager of the Pier Bowl’s Casa Tropicana Inn. With 11 years experience in the travel and leisure industry, Marjorie brings with her a well-developed sense of five star service and true guest pampering. Combining forces with Casa Tropicana owner Rick Anderson, Marjorie has set out on an ambitious effort to celebrate San Clemente’s relaxed atmosphere. Being fully aware of today’s lodging market’s desire for something hip, cool and calming, they are transforming the Casa’s tropical themed rooms into refined boutique-like Casitas. Each room is inspired by the beauty of the ocean and uniquely designed with luxurious linens, custom accessories and original art provided by local Gallery 104. 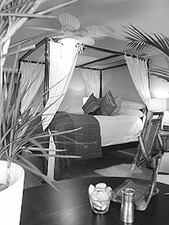 Even the name is changing from Casa Tropicana Bed and Breakfast Inn to Casa Tropicana Inn and Spa. Yes, Spa! There are plans in the works to develop three treatment rooms (two massage therapy/body treatment spaces -one for couples, and an esthetician studio) that will feature a high end line of spa products. Also planned is a signature selection of teas developed with the help of San Clemente’s very own Lavender Lounge Tea Company. 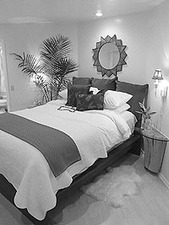 The new Casa Tropicana Inn and Spa will welcome the summer of 2005 with eight guest-rooms and a day spa. With the addition of the increasingly popular and locally renowned fine-dining restaurant White Horses, housed in the same building, will guarantee guests won’t have far to go to escape, rejuvenate and have all their wishes fulfilled. The San Clemente Journal and the Casa Tropicana inn 7 spa will be celebrating their 10th & 15th Anniversaries together with an Open House at the Casa Tropicana on June 30th. Rick and Marjorie will have all the newly remodeled Casitas open for viewing, there will be food from area restaurants, a little music and a chance to chat with our staff, advertisers and readers while enjoying one of the truly great views of San Clemente.